Sequence Name:-This is an optional field.The sequence name may have letters and number with the "-" or "_". All other character are non-permissible.The field is assigned a default name "GPCR". The sequence name is just used for only your information. It may be a problem with #,$,@ or an empty space within the name of the sequence, which is not allowed for reasons of security. Input Sequence:-The server provides two options for submitting the query sequence. The user can paste plain sequence in the provided inbox.The server also has the facility for uploading the local sequence files. Amino acid sequences must be entered in the one-letter code.All the non standard characters will be ignored from the sequence.A sample of submission form with labeled fields is shown below. 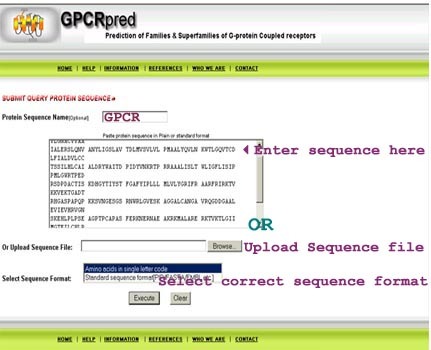 Sequence Format:-The server can accept both the formatted or unformatted raw antigenic sequences.The server uses ReadSeq routine to parse the input.The user should choose whether the sequence uploaded or pasted is plain or formatted before running prediction.The results of the prediction will be wrong if the format chosen is wrong. 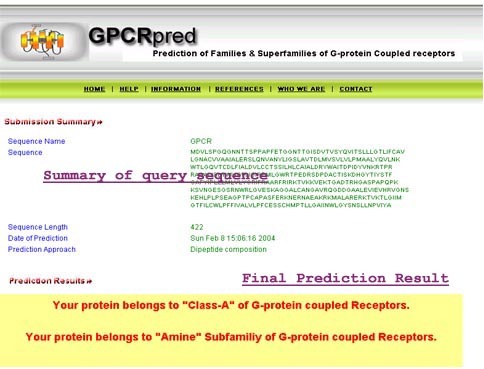 Prediction Result:-After analysis the prediction results are shown in user-friendly format.The results provides information about summary of submitted sequence and final prediction results.The summary of sequence provides information about name of sequence, sequence, its length and prediction approach.The final prediction results provides information whether the predicted sequence belong to GPCR superfamily or not. If the sequence belong to GPCR, the information about its class and subfamily is also provided. A sample of prediction output is shown below.